There are more than a few “great loves” in the life of Bernie Price, and one is passionately on display mere minutes after a championship game in the archdiocese’s Catholic Youth Organization (CYO). The two girls’ volleyball teams have just finished a well-played, intense championship that has left one group of seventh- and eighth-grade girls beaming and jumping in joy while the other team slumps off the court, with some of the girls crying. In the midst of these polar opposite emotions, Price soon gathers the two teams together in her official role as the CYO’s director of girls’ athletics. 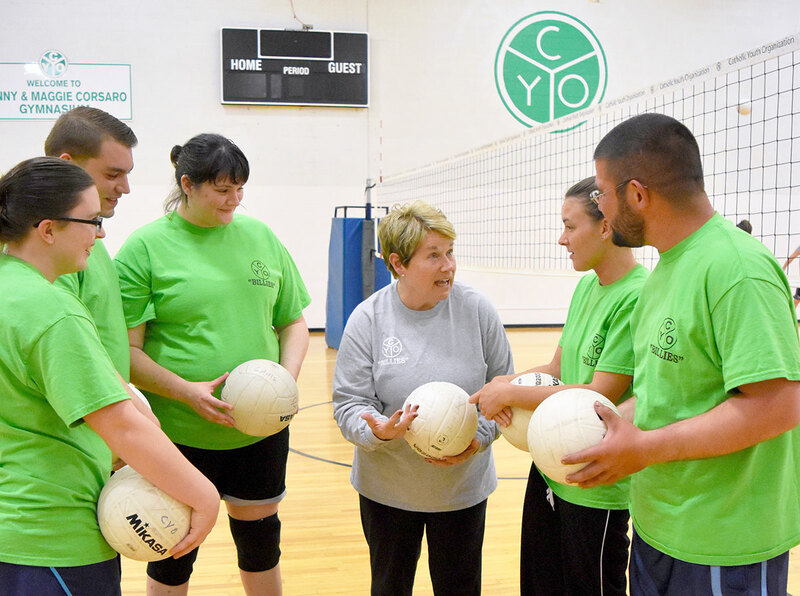 She is there to present trophies to the two teams, and she has always lived for this moment during her 42 1/2 years of joyous, give-everything-you-have dedication to serving the CYO and the children and youths of the archdiocese. When the girls do, Price’s voice rises—“loudly,” she admits. And with no need of a microphone, she roars, “If anyone wants their money back, you’re not going to get it because you’ve gotten your money’s worth and more.” And her eyes turn again to the girls on both teams. Here’s another “great love” story from the life of Price—one that comes to light in a pitch-black cavern in Kentucky. At the time—in 2014—the then-63-year-old Price was traveling with the high school youth group from Good Shepherd Parish in Indianapolis, a group she has led for about 40 years. During those four decades, Price has established an amazing connection of friendship and support between the Good Shepherd youths and the youths at the Damar Homes in Indianapolis who are developmentally and behaviorally challenged. But this outing to Kentucky was an adventure for the Good Shepherd youths, an adventure that included zip-lining through the pitch-black cavern—90 feet above the cavern floor. More than 40 years of dedication to the CYO. More than 40 years of leading a parish youth group as a volunteer. Yet, both those tremendous examples of service don’t even come close to the total commitment that Price makes to the lives of others and to her Catholic faith, says Ed Tinder, the longtime executive director of the archdiocese’s CYO. Tinder then shares a lengthy yet partial list of her involvement: spearheading fundraisers for Damar, Central Catholic School, St. Paul Hermitage and the Benedictine sisters at Our Lady of Grace Monastery in Beech Grove; leading trips for senior citizens from Good Shepherd; and serving on an advisory board for a college fraternity. All while leading the efforts to make CYO sports possible for 5,000 girls in seven sports. That passion and caring lead to another story of one of her great loves. “I believe that if you push the right buttons, you can bring out the best in anyone,” Price says. At 15, Celia Ward believes she gets the essence of Price. Price also has a fondness for the children and youths who benefit from Damar Services, says Donna Stutler, the development director for Damar. “It was real important for her to find a good cause for children helping children,” says Stutler about the longtime relationship that Price has cultivated between Good Shepherd Parish and Damar. “Many of the kids from Good Shepherd who have gone through that experience have gone on to study child development and mental health counseling in college. Some of them have come to work here. That says a lot. That sentiment leads to one more story about Price—the story of the great love of her life. When Bernie first met Jack Price at a party, she was attracted to his intelligence and his sensitivity. It also didn’t hurt his cause that her mother took an immediate liking to him when he showed up for his first date with Bernie—a date that included taking her mom shopping. In fact, the shopping trip ended with Jack strapping a new rocking chair for Bernie’s mom to the top of his Ford Mustang. For more than 40 years, Bernie was married to Jack, whom she describes as the person “who will always have first place in my heart and soul.” Then heartbreak struck. At 64, Jack unexpectedly collapsed on Dec. 21, 2011. He died three days later on the morning of Christmas Eve. Five years later, she often wears the ring. Their bond endures in another special way. She keeps connecting youths of different abilities, helping them live their faith. She keeps finding time to support the great loves of her life because of the great love she has known in her life.